The county cricket season is all but over and your picks for the team of 2018 are in. More than 16,000 entries were received and BBC Sport has assimilated all the information and selected a final XI. Unsurprisingly, Division One champions Surrey dominated the voting with five players making the cut. But competition for places was once again tough with James Hildreth, Dane Vilas, Tom Bailey, Ed Barnard, James Harris, Ollie Robinson and Jeetan Patel all narrowly missing out. Here is the team of the season, as chosen by BBC Sport users. What were the other 2% of voters thinking? Burns has the daunting task of filling the void left by Alastair Cook's retirement at the top of England's batting line-up for the tour to Sri Lanka. But yet another incredible domestic season suggests he is ready, The 28-year-old captained Surrey to the Division One title, scoring four centuries and seven fifties and averaging just shy of 70. Mitchell remained a dependable presence in a disappointing County Championship season for Worcestershire, in which they were relegated from Division One. The former skipper and Professional Cricketers' Association chairman completed his fourth century during their final game of the season against Yorkshire to take his first-class tally to 35 and continue an impressive conversion rate, having managed 83 scores of 50 or more during his career. A season without the responsibility of captaincy has done Bell the power of good. More than 1,000 Championship runs in 2018 meant the five-time Ashes winner was talking up his England ambitions again with his zest for batting well and truly rediscovered. Add in an average of 56.17 and five centuries and it's easy to see why there was a gathering clamour for an experienced, wily batsman to bolster an often fragile Test line-up. The Hampshire captain remains very much in the thoughts of the international selectors after another solid domestic season. The 27-year-old scored 76 on his last England Test appearance, against New Zealand in April, but managed to pass 50 just three times in his 11 Test innings during the winter. Three centuries for his county and close to 1,000 runs - including a top score of 201 not out - will have done his long-term chances no harm, although they were not enough to earn him place in the squad for the forthcoming tour to Sri Lanka. An almost perfect season for the talented middle-order batsman. Pope's impressive statistics, which saw the 20-year-old average more than 70, helped earn Surrey their first County Championship title since 2002 and brought England Test recognition. He was still playing school cricket as recently as 2016 but did enough for his county and in two appearances against India to merit selection for the Sri Lanka tour. The third of five Surrey men to make the cut, Foakes was the chosen one behind the stumps last season and similar figures saw him feature in more than half of the votes. England's strength in wicketkeeping back-up means he misses out on a second successive winter with the Test squad, but another 592 Championship runs at almost 40 will keep him very much in the thinking. Rikki Clarke's contribution at the county where he started out as a professional has been quite something. The 36-year all-rounder excelled with bat and ball, hitting one century, two half-centuries and weighing in with 45 wickets for the champions. "He's one of our own", said director of cricket Alec Stewart when re-signing Clarke before the season got under way. Surely even Stewart could not have predicted the impact Clarke would make? Spinner Harmer was a star turn for Essex in his first season and the South African backed that up to retain his spot in your best county line-up for 2018. His haul of 56 wickets was 16 below last season's total when Essex won the title, but only Graham Onions (57) took more in Division One. 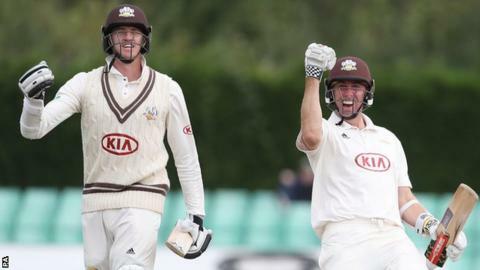 An absolute certain selection, Morkel's pace, aggression and accuracy was a key factor in Surrey's four-day success. The top division's standout bowler took 54 wickets at an average of just over 13.5 with four five-wicket hauls thrown in for good measure. Sometime stats tell you more than enough to make a decision. The New Zealand pace bowler was out in front as the leading wicket-taker in Division Two, and unsurprisingly a big reason behind Kent's stunning season. Five times Henry picked up five wickets in an innings with his best figures of 7-42 coming as he took 11 wickets against Northants. Lancashire's 'gamble' on offering the former England seamer a two-year deal after an injury-plagued spell worked out rather well for both parties, although his efforts could not prevent the Red Rose being relegated from Division One of the County Championship. Onions, Durham's all-time leading wicket-taker, added 57 more in 12 appearances in the four-day format. He also managed two five-wicket hauls, proving both his quality and durability. BBC users' squad selected based on data until 08:00 BST on Sunday, 23 September. Who made your county team of the season?